Agricultural expansion is a central component of the history of the resettlement of the Canadian prairies in the nineteenth-century. Popularly, that history has been characterized by the challenges of aridity on a dry prairie landscape. The characterization of the prairies as a dry place, however, is really only accurate for the highlands of south-western Manitoba to the foothills of southern Alberta. It does not accurately represent Manitoba’s southern lowlands. This is the subject of a new book by environmental historian, Shannon Stunden Bower. Wet Prairie: People, Land, and Water in Agricultural Manitoba explores the history of this southern lowland region of Canada’s first prairie province. Combining methodologies in both environmental history and historical geography, Wet Prairie, takes readers through the complex past of the relationship between people and surface water in a region that is especially prone to flooding. This month, we speak with Dr. Shannon Stunden Bower, a Social Sciences and Humanities Research Council of Canada Postdoctoral Research Fellow from the Department of History and Classics at the University of Alberta. 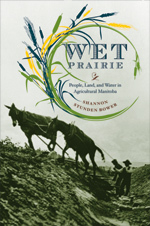 Shannon Stunden Bower, Wet Prairie: People, Land, and Water in Agricultural Manitoba. Vancouver: UBC Press,2011.